Indians pitcher Justin Masterson continues to lead all players in Box-Toppers points as of Thursday, Aug. 15, with 16.4 points. Dodgers pitcher Clayton Kershaw, in second place overall, leads all National League players with 15.7 points. He passes previous NL leader, Diamondbacks pitcher Patrick Corbin (15.4), who is now in third overall. Miguel Cabrera of the Tigers remains the leader among American League batters with 13.4 Box-Toppers points. However, Cabrera fell from seventh to ninth place overall this week. 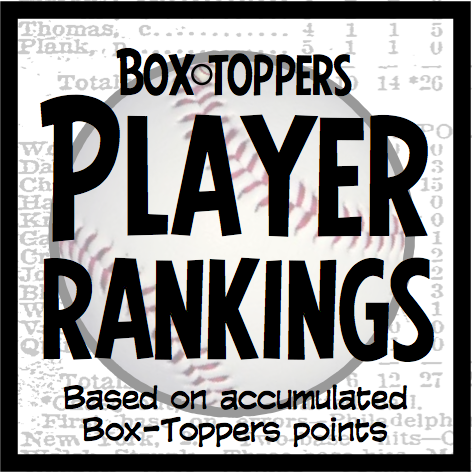 Paul Goldschmidt of the Diamondbacks now leads among NL batters with 11.7 Box-Toppers points. Goldschmidt passed previous leader, Carlos Gonzalez of the Rockies (11.0). Goldschmidt is in 20th place among all players. Thirty players have accumulated 10.0 or more Box-Toppers points so far this season. Only four are batters—Cabrera, Goldschmidt, Gonzalez and Chris Davis of the Orioles (11.2). Previous player rankings report from Aug. 8.